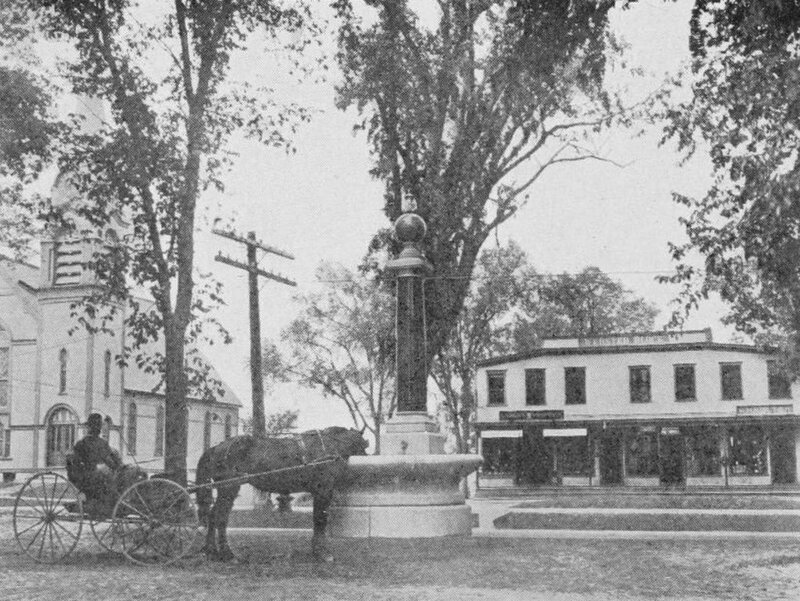 The Belcher Memorial Fountain, at the corner of Warwick Road and Main Street in Northfield, around 1910. Image from All About Northfield (1910). 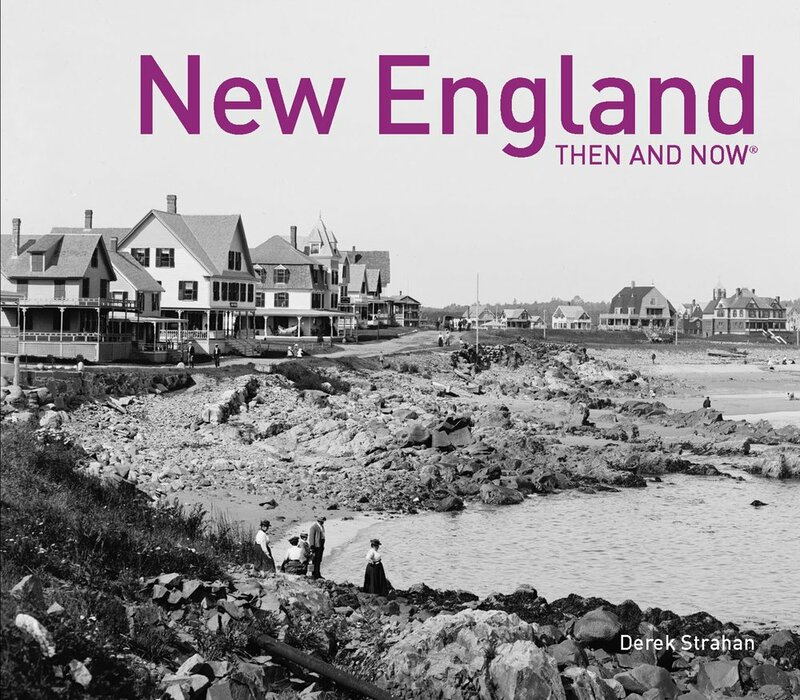 The first photo was taken within about a year of the installation of the Belcher Memorial Fountain, which was originally placed in the center of Warwick Road, at the corner of Main Street. The 16-foot-tall, 27.5-ton granite fountain was given to the town as a bequest from Mary and Eliza Belcher. 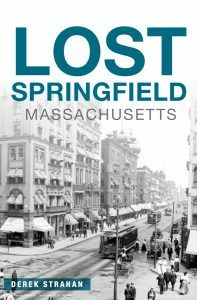 The two elderly sisters never married, and were the last living members of the Belcher family in Northfield. They both died in 1907, seven months apart from each other, leaving money to the town to build a fountain here in the center of town, which was dedicated on September 14, 1909. Aside from the fountain, the first photo shows two buildings in the background on Main Street. 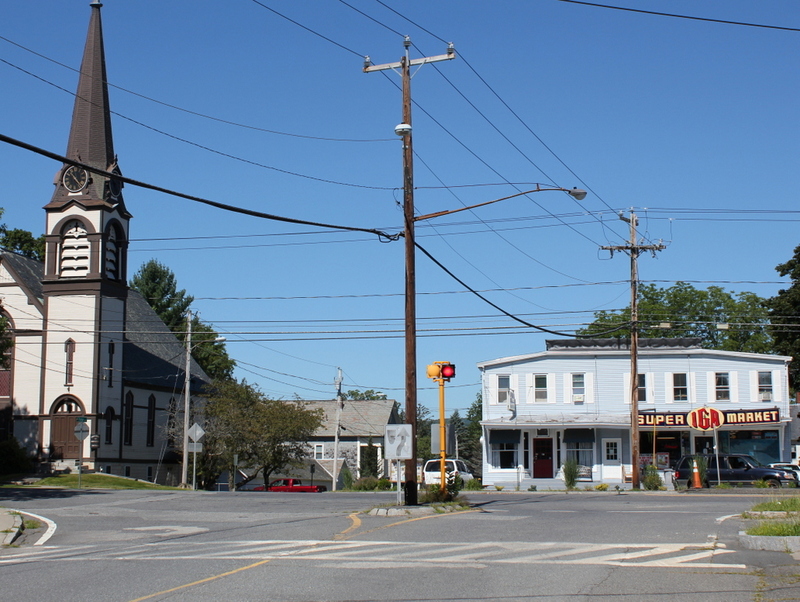 On the left is the Unitarian Church, which was built in 1871 to replace an earlier church building that had burned. It was the work of noted Worcester architect Elbridge Boyden, and features a Gothic Revival-style that was popular for churches of the era. Contrasting with the ornate style of the church is the modest Webster Block on the right. This two-story, wood-frame commercial building was built in the late 1800s, and housed a variety of businesses over the years, including a drugstore, a grocery store, a shoe store, and the village post office. Today, this scene has not changed significantly. Both the church and the Webster Block are still standing, and neither have had any major alterations. The only real change between the two photos is the fountain itself, which was moved a short distance to the south of here in 1960 and now stands next to the town hall. Although originally intended to provide water for horses, as the first photo shows, this purpose became obsolete as cars replaced horse-drawn vehicles. The fountain likely became a hazard to vehicles, since it sat in the middle of the intersection, and it was subsequently replaced with a small traffic island marked by a flashing light.